Sitting pretty on the corner of a quiet residential street, this sociable house ranges over three floors and has a small garden for alfresco drinks and dining. The smart entrance has original decorative floor tiles and oak floor boards leading to the kitchen. The large 'L' shaped contemporary fitted kitchen has a range style cooker with a 5 ring gas hob over two ovens. The units hold a microwave, a dishwasher, a large fridge and plenty of extra storage. A large wood topped central island with more storage underneath has 3 comfortable bar stools and a there is a docking station for an I-phone/I-pad/1-pod. The dining table seats 8 with another small gate legged table that can be added on to the end to accommodate another 2. Off the kitchen is a newly renovated bathroom with WC, hand basin and shower. Alongside in separate utility cupboard is a washing machine and mini-freezer and just outside is a tanked cupboard housing the tumble dryer. Floor to ceiling glass doors lead off from the dining table and open up fully to the private garden. Outside is an attractive little walled garden with an outdoor table and chairs for 6 on a sun deck beside a paved lawn. A gas BBQ is on the sun deck. On this floor is a large bedroom with an original marble fireplace. There is a painted cream and oak chest of drawers and wardrobe, TV and a large armchair in a spacious bay window. Two 3' beds can zip and link to become a 6' bed. A large, pleasant blue and oak living room looks over towards pretty Victorian terraced houses and gardens that line this street. The room has an elegant original cast iron fireplace at one end with a mirror over. There is a large TV with DVD and a bookcase in an alcove with a selection of books and films. Seating is provided by a large dark blue 3-seater sofa, a compact 2 seater sofa in the bay window, a large pale blue armchair and a 2 seater sofa-bed. A spacious double room with an original tiled decorative fireplace has a 4'6'' bed, a tallboy and fitted wardrobe in one alcove. Two large sash windows overlook quiet residential streets. Further along on this floor is a pretty terracotta coloured twin room with two 3' beds, a chest of drawers with mirror over and small fitted wardrobe. Also at this level is a family sized bathroom tiled throughout in terrazzo tiles, with bath, a shower handset, hand basin, WC and storage. Under the eaves is a very spacious double room in blue and red with an original cast iron fireplace and en-suite. Two sash windows look over pretty streets and gardens to the hills beyond. All the furniture is contemporary oak and comprises of a 5' bed, (with restricted headroom at the head of the bed) two chests of drawers and a large wardrobe. The room also has a large blue armchair and a TV. 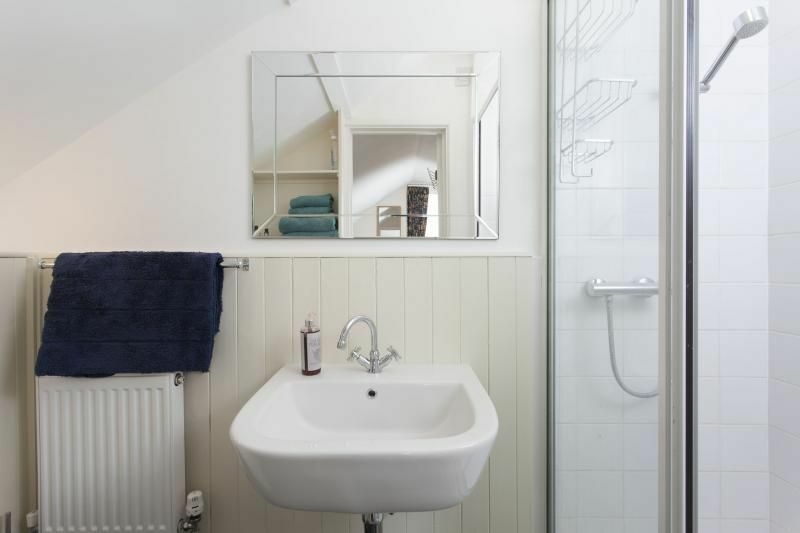 A compact en-suite has a shower, hand basin and WC along with lots of shelving for storage. Finally, there is a pretty single room with an original fireplace and a window overlooking the hills that form a ring around the city. There is a 3' bed and small chest of drawers with hanging space available in a landing cupboard. There is also another 3' trundle bed should room for a 10th person be needed. The property comes with a garage to park a small/medium size car (size of garage is 4.88 m x 2.44m (16' x 8'). There is also an extra permit allowing another car to park in the residents bays. Therefore you can park two cars when booking Avonleigh House. Alternatively the Bath Spa train and bus stations are a 5 minute walk away. The property benefits from being equal distance to the Bath high street and another gorgeous area of Bath called Widcombe. The local facilities in Widcombe Parade are very good and include a newsagent, chemist, a couple of coffee shops, hairdressers, florists, and several pubs, restaurants and Indian, Chinese and American takeaways. Alternatively Bath has a vast array of exciting shops, restaurants, bars, and cafes to choose from. There are many historic sites nearby along with museums and galleries. Visit the Komedia comedy club, the theatre Royal, or the Thermae Spa. Take a boat ride up river and have lunch at The Mill a popular waterside pub, rent bikes to ride along the canal towpath towards Bradford-upon Avon. Or simply enjoy the lovely city parks. Marks and Spencers or Waitrose are nearby for food supplies. The property is only a minute walk away from the canal where you can walk to Widcombe in one direction or as far as Bathampton in the other direction. Bike hire is also close by if you wanted to explore the canal path by bike. Alternatively long boats are available to hire if you wanted to do something different on your holiday by cruising down the canal. Lovely house, great location, canal walk to Widicombe and its lovely pubs and shops an extra bonus. Well equipped house in great location for town. Parking a bit of an issue if in a big group. Nice outdoor area if the weather is good. Clean, modern, stylish with all the modern compliance’s to assist with a stay It was excellently furnished and clean and lovely bathrooms. The kitchen was really well equipped to assist with any catering needs. Excellent location and the garden is beautiful. Very nice house, quiet surroundings, yet short walk to the city center. Kitchen equipment very good, great welcome package. The beds were very comfortable, great courtyard. Very nice reception by Marcus. The stay was really nice. We had a brilliant weekend at Bath and much of that was down to the great layout and facilities at Avonleigh House, a really excellent property for a social gathering involving extended family and friends. We hired the Avonleigh house in Bath for my best friends hen do. The location was perfect! A short walk across the river into the city. It was so good the house came with 2 parking permits & a garage which was great as we came in 3 cars. The communication with Bath holiday rentals has always been very good. I would definitely use them again & recommend to everyone. Nice little touches to the house when we arrived which made it feel very special. A special thanks to Alexa & Marcus!! We stayed in Avonleigh House in Sept and it was fabulous! Bath Rentals were very professional and helpful and I would highly recommend them if you considering renting in that area. Avonleigh hse was comfortable spacious and well equipped and we really enjoyed our stay. My family/friends have just returned from almost a week's stay a Avonleigh House. We were 9 in all and the house was spacious and comfortable for all of us and all our needs. Robert welcomed us and was extremely helpful. 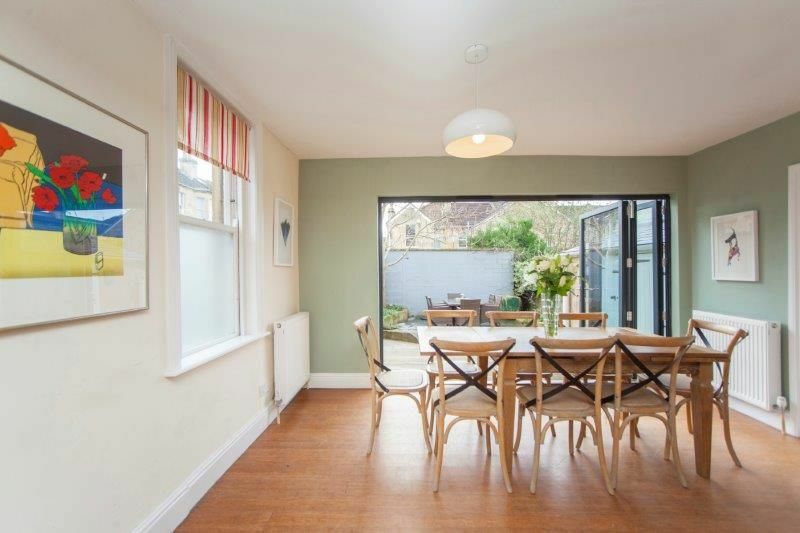 The location is also great with only a very short walking distance to Bath city centre. I definitely recommend this place for large groups. Just to let you know, we had a fantastic time in Bath last weekend. The house was just perfect! Thank you also for recommending Cavendish Cooks. We arranged some meals for the Friday evening and they were delicious. Many thanks again for a wonderul stay. Thank you we all had a fabulous weekend. The house was perfect and enjoyed by all the family. It was nice to park the car for the weekend taking only a few minutes to be right in the heart of Bath. This is the second time this year that we have used Bath Holiday Rentals and would recommend you to anyone looking for a relaxing weekend in Bath. We thoroughly enjoyed our stay at Avonleigh House for my sister in laws hen weekend in Bath. The house was in a great location, (only a very short walk into the city centre, even our heavily pregnant & older guests found the walk easy). The house itsself was really beautiful, clean, spacious & has a fab layout, very sociable with the large kitchen & dining area. And we especially loved the bifold doors to the suntrap patio area. Alexa & the team at Bath Holiday Rentals were very helpful and friendly and made everything very simple. I would definitely highly recommend & I am very likely to use again myself in the future. I was asked a few days ago if I would write a short testimonial, my apologies for the lateness of my reply but I am thrilled to say that myself and my fellow hens had an incredible stay in Avonleigh House. I was everything we hoped for and the best part about it was all me had to do was rock up, unpack, and hit the town, everything was catered for and the house was perfect. Thank you to the team at Bath Holiday Rentals for thinking of everything. We thoroughly enjoyed our stay at the Avonleigh house. It was perfect for our group of 10 and the location was perfect. It was a quick 10 minute walk to the city center (Abbey Hotel) and it was a lovely walk at that. It was equally easy to get to and from the Bath Spa train station. The house itself was comfortable with everything we needed. Olivia was very kind in meeting us at the home as soon as we could get there. Communication throughout the rental process was very good. I would definitely recommend the home. It made our stay in Bath very special. Thank you very much. We had a wonderful time in bath. The house was fantastic, the kitchen dinner was a great place to socialse. It was so well equipped everything you could need was there. The finishing touches of a little welcome pack tea, biscuits etc and toileties were a nice surprise. The location was perfect, a short walk to the city and night life but quiet and restful too. It made my sisters hen weekend one to remember. Thank you for your efficient and friendly service too. We spent a lovely four nights in Bath at Avonleigh House in April 2016. Once we all arrived we were a group of 8 and the 5 bedrooms accommodated us all beautifully! Although we only used the kitchen for breakfasts, it was fully equipped and Bath Holiday Rentals had nicely provided a few breakfast essentials to get us started! We easily walked from the house, across the river and into central Bath every day; good restaurants (like Sotto Sotto) are nearby. We also ate at good pubs (within walking distance) on "our" side of the river as well. We thoroughly enjoyed our stay and highly recommend Avonleigh House, and the folks at Bath Holiday Rentals were wonderful to work with. I hope to return someday soon! We had a brilliant stay at Avonleigh house, it was clean and comfortable and everyone commented on what a nice house it was to stay in. We had a fantastic girls weekend in Bath, it's a lovely city. Thank you for your email and confirmation of damage deposit. The house was fantastic and completely suited our needs, especially the large open plan kitchen. Great location and few minutes walk in to town also made the weekend more enjoyable not having to worry about transport. Thanks also to Olivia for making the arrival at Avonleigh House so seamless and stress free. Our family of 7 truly enjoyed our stay at Avonleigh House. The house was perfect with plenty of space and a great location. We even enjoyed the 3 levels for a bit of exercise on the stairs. The kitchen had everything we needed and the laundry washer and dryer were very handy to have. Warning that the one car garage has space for a small car only. The parking permit was great to have for our second car. Thanks for everything! Thanks so much for a truly wonderful weekend. The house was everything we wanted and more, it felt so much like a home away from home we all had a fantastic time! Yes the house was ideal for our long weekend (mid August 2015). One of my sons was getting married on the Saturday so the house was the base for the grooms family - uncles, aunts, siblings and partners and myself. We used all the rooms at times. The kitchen and the sitting room on the first floor were particularly successful. The kitchen was very well equipped with everything that we needed for big family meals (x2) and for relaxed breakfasts. I was worried that there wouldn't be enough bathrooms and lavatories but this did not turn out to be the case. The lavatory on the ground floor was particularly useful. It rained for much of our stay (but luckily not on the wedding day) so there was little opportunity to sit/eat out in the garden area - however my only quibble is it would have been nice if the shrubbery in the back garden had been cut back and tidied. The location of the house, although not in a classic area of Bath was lovely with the proximity of the canal and great views over the city. 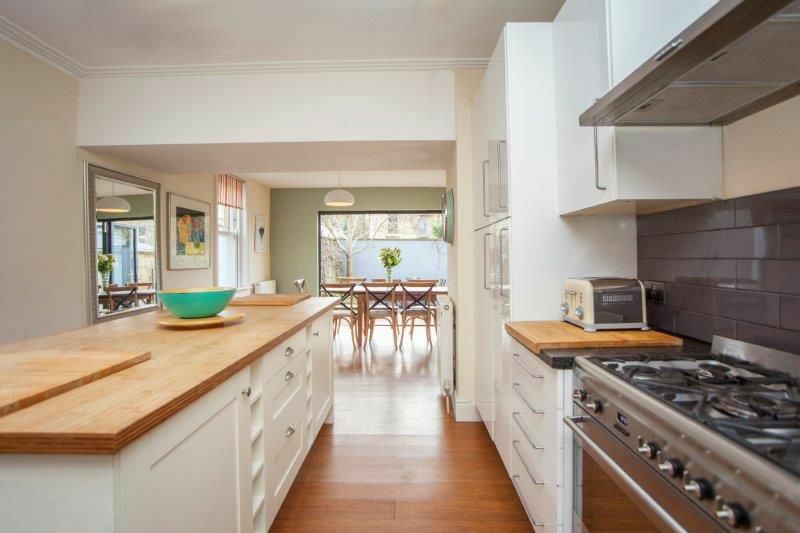 Its location on a quiet street corner gives it a lovely light double aspect. It is also close but not on major roads and also within 10 minutes walk of the centre. I can imagine spending another long weekend in Bath, probably in a smaller property, and will use your website again as well as recommending it to friends. I just wanted to touch base with you to let you know how much we enjoyed our stay at the Avonleigh! The house is in a wonderful location, so accessible to the main square, very clean and welcoming. It was so nice of you to leave a few "things" for us also! We enjoyed the wine on the deck one evening and the kids all enjoyed the muesli, chocolate and cookies!! What a special touch! The restaurant suggestions were great too-the only problem was the one that we really wanted to go to Soto Soto was booked for the nights were in Bath. Oh well, I guess we will have to come back! And our stay will definitely be with Bath Rentals!! Avonleigh House made the perfect family base for us for my recent wedding in Bath. The house was spacious, light, immaculately clean and well equipped throughout. It is very conveniently located indeed for the city centre, but nonetheless in a very quiet area. Robert, who welcomed us to the house, could not have been more friendly or helpful. Thank you for a wonderful stay! My friend and I loved our stay at Avonleigh House, all the rooms were great but we especially loved the kitchen. It was a great space to have dinner and the welcome treats were much appreciated. The location was great, we walked into the main town very quickly and easily. Would definitely recommend this house and stay there again anytime. We had a great stay at Avonleigh which was clean and spacious and ideal for the family break we had planned. It was very convenient for the city centre and having off street parking as a useful bonus. Olivia was very helpful at handover and we would definitely consider using the property or one of your others again if we were coming to Bath. I recently stayed at Avonleigh with a group of friends over a weekend. We had a fantastic time, the house is ideally situated for access into town and more importantly it is only about a ten minute walk to the Spa. It is a lovely house with a great kitchen/dining area and an extremely comfy lounge. It is extremely well equipped and the welcome pack was also a great idea, I would definitely stay again. Myself and friends have spent many a weekend away at various houses around the country; this one is the best yet. Great location (easily walkable to the city centre), nice welcome pack and information file, super comfy beds, throws & linen. Has everything you'll need. A real home form home. Total pleasure to stay here. Thank you, we had a wonderful weekend - I'm sure we will be back (at the very least I will be). The house was smashing, just what we needed - great location, well equipped and with the weather we had the private garden was a massive bonus. The house was luxurious and a lovely place for us all to relax with a drink and a chat on the Friday night we arrived. It was an easy walk to Thermae Spa the next day and an even easier walk to Opa! Nightclub in the evening - there was no need to co-ordinate everybody or pay for expensive cabs. We also enjoyed making the most of the sun in the garden and eating in the fabulous kitchen! 'Thank you for a fabulous weekend. Not only was the property stunning (photos do not do it justice! ), but the hospitality received on arrival was beyond expected. 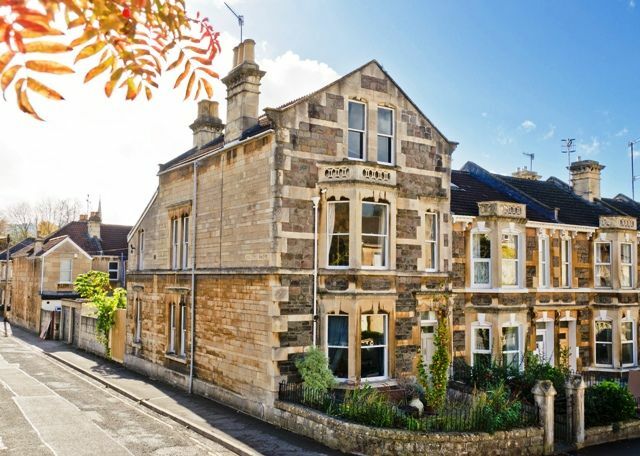 The house is located a short distance from town, making Bath city centre very accessible. The house was plenty big enough for all of us and the large kitchen was a great place to entertain.The only concern we had was parking as there is only enough parking for two cars, which is worth bearing that in mind. The ticket inspectors are very vigilant!! !Overall myself and all the girls had a great time and I have already recommended this house to others.